How do you get a great IELTS Speaking band score? Get some tips and explanations in this article. 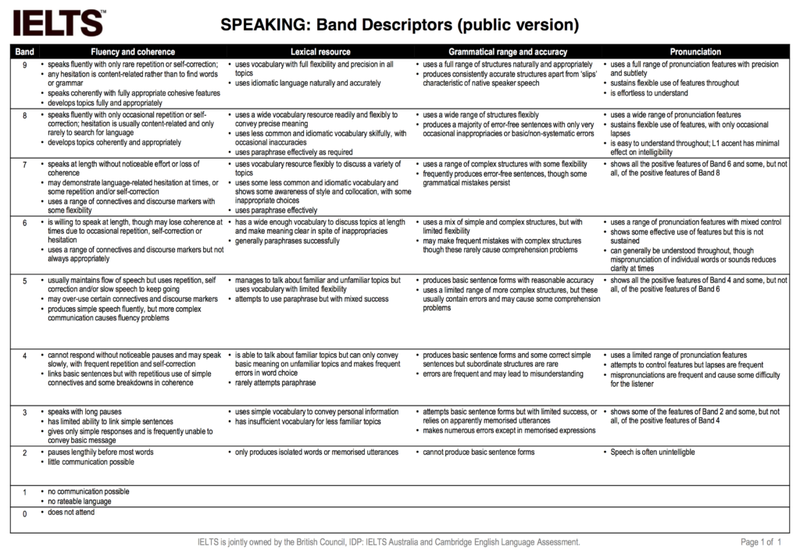 In order to calculate your IELTS Speaking band score, examiners have a table of descriptors. These descriptors describe how an IELTS candidate might perform at different band scores. Here is the table – click on the image to see it full-size. You need to understand these band descriptors. Fluency and Coherence: this is about your rate of speech, and whether you can continue speaking without stopping too much. It is also about how well you organize and order your ideas, and how well you connect your ideas (e.g. with words like ‘next’, ‘secondly’, ‘because of’, in order to’). Lexical Resource: this is about the range and accuracy of your language, how appropriate is your language, and how well you can get around a gap in your language knowledge by using alternative words. Grammatical Range and Accuracy: this is about the length of your sentences and if you are using a wide range of language structures, such as relative and subordinate clauses, and noun phrases. Accuracy is measured by the number of grammatical errors you make and the effect of those errors on communication. Pronunciation: this is about how understandable your speech is to the IELTS examiner. Ok, you want a band score of 8.0 don’t you? Or close to an 8.0. So let’s look at the band descriptors for an 8.0. What should you do to get an 8.0 in the speaking test? You speak English at a normal speed, about the same as a native speaker. You might sometimes repeat yourself. You make an occasional mistake with language, but you do correct yourself. You usually keep talking, but you do hesitate at times in order to think about your ideas (e.g. by looking at your notes) or language (but this is rare). This is really important in part 2 of the IELTS speaking test. Your ideas are well organized and the IELTS examiner can understand your ideas easily. You use a wide range of vocabulary, and you sometimes use words with a precise meaning to put over your ideas. You use some idiomatic language, and some less common language, but you might make some errors (e.g. with collocation). You can paraphrase language used in questions, especially in parts 2 and 3 of the test. You use a wide range of grammatical structures to put across your ideas. Most of your sentences are error free. You make a few basic grammatical errors but these don’t get in the way of communication. Your accent is generally easy to understand, although the IELTS examiner might not immediately understand some words. You have good stress and intonation, and words that run in together (e.g. best time) can be easily understood by the examiner. You do not need to sound like a native speaker, even to get a 9.0. An accent is fine, as long as you can be easily understood. If you would like to find out more about pronunciation, there’s a great article on pronunciation features written by Christopher Pell of IELTS Advantage.